This is a delightful backpack, touching a number of beautiful lakes, breathtaking views of the high country, and a lush river canyon. The fishing was fantastic at times (forty-fish days, golden trout, rainbows, golden-rainbow hybrids, brookies), challenging in some lakes, and always rewarding. The water was crystal clear, often with a turquoise tint. We had high temperatures in the 70's, and brief lows in the 40's. At the end we had spotty rain that provided a diversion from the great fishing. On the last morning the river turned to a chocolate milk color and we headed out to the trailhead. Regrets? Well, the great cascades we had to pass by seemed to call out for a swim, but the fishing and hiking left limited time for swimming. The hot springs felt "Oh so good" on day three. The troop covered over thirty miles in six days. The first and last day's hiking covered eight miles each, leaving less than five miles per day for the intervening days. We had two to six hours of play-time each day! Mike and Pat McGuire deserve a great many thanks for sharing this with us, and for setting up the planning and complicated details! We all met at the ranger station to pick up the permits Mike had reserved. If you go, you will need to carry the infamous bear canisters. The group found they double as great stools to sit on while savoring dinner and campfires. Attendees: Pat and Mike McGuire, Rodney Chun, Dennis Maxwell, Tony Plutinsky, Bob Schwehr. After a great dinner in town, we left the Mary Lake/Duck Pass trailhead at 7:30AM with great anticipation, a little nervousness about the sixteen-hundred-foot gain and heavy packs. The trail passes several lakes and touches Arrowhead, Skelton (really pretty), and Barney on the way to the pass. By the way, this would make a splendid day hike and fish excursion. The trail is wooded and climbs through fields on granite and duff. It is not a "walk in the park", but it's not a "death march" either (at least not after it's done). The last climb to Duck Pass is exposed, but the trail is great, and the switchbacks meant it was never overly strenuous. The pass, at about 10,500 feet, was achieved by 10:15 for the middle three of us. Tony made it in far less time. Pat and Mike made it by 11AM. We all, except Pat and Mike, took a break at the top to recharge our batteries. They seemed to hike in the rear much of the time that day, but every time we took a break, they passed us again. 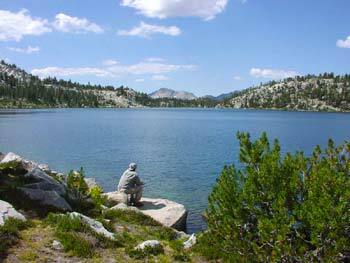 Duck Lake is clear, very large, and sits in a granite basin. We did not see any fish from above. We saw several people and a couple of horse groups go byundefinedday trippers. After lunch we hiked "down" to Purple Lake. It goes down all right, but then it goes back up again, and over to the lake. The trail is sandy, hot, and slow. 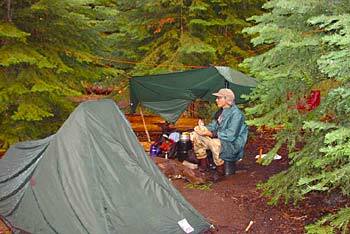 Purple Lake was a welcome sight, with camps that we used on the south side and along the outlet creek. The site by the lake was really pretty, but it had very small patches for tents. Bob caught ten eight- to twelve-inch fish before dinner. After dinner, it was slow. It was a great place to swim, but we were really tired out, yet happy to be back in the mountains. There was a mud patch by the lake; tracks of bear, deer, and coyote were readily evident in it. Tony hung a bear bag, and did a little jig-dance to assure that the bears would not find it. He wanted to hang it by Bob (so he could guard it?). That did not happen. Picking the tree for the bag was probably the most difficult decision of the trip. The bears did not get it. We went mostly "down" to Virginia Lake. This is a truly uplifting mountain lake. 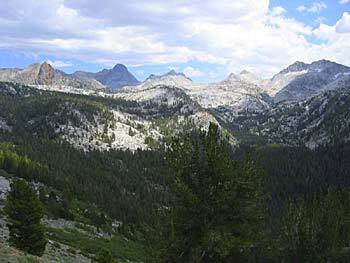 It lies in a high pocket of granite, rimmed by tall trees, and overlooks the western Sierra high country. It is open, the water is clear, and the twelve- to sixteen-inch rainbows come ripping up to flies, only to false strike. Several fish were on with a "long release" following the first jump. Mike had the big-fish honors with a sixteen-inch rainbow on a bushy woolly bugger. We spent two hours there and were reluctant to leave. Pat assured us the best was yet ahead. Tony stayed behind for a nap and swim. The drop to Tully Hole is, in fact a dramatic downhill into a lush valley. Ahead, and all around are the high peaks of the southern Sierra. Below is the lush meadow stream of upper Fish Creek. The trail drops over eight hundred feet on tight switchbacks. The bottom called for a nap. Mike had declared a campsite along the creek as the goal. We would never have found it had not Pat called out of the woods as we passed by it for the second time. It was private, with lots of room, and places to spread out with some privacy. The fish were cooperative, and all goldens! After the lakes, the fishing in the tight trees and brush took some getting used to. Several flies were left in the trees before leaders were shortened. Everyone caught fish, limited by the frustration factor. Mike was really in his prime on this stream. I think he fished all through the night. Tony made fish for dinner. Several of us swam in the pocket water. There were some neat little granite cascades just below camp. We sat around the campfire and told tall tales. The four miles down was really easy. 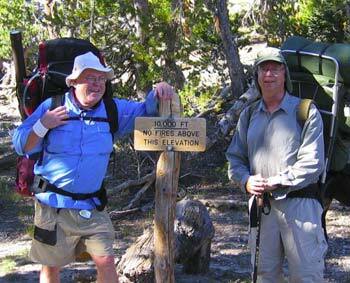 We encountered two dingy guys at the point we left the JMT. We took each other's pictures, exchanged tips and stories. As we left, one of them started to come with us. ??? I guess they were just tired. [Ed. I think one was on distinct chemical support]. They were bound for Silver Pass and Mount Whitney. The trail soon returned us to Fish Creek at a spot remarkable for a fifteen-foot waterfall with a swimming-pool-sized reflecting pool. Bob, Rodney, and Dennis were so taken, they spent a half-hour just taking it in and debating whether to fish it. We wanted to set up camp by noon, the better to play for the rest of the day, so we pushed on. At the first creek crossing, we met up with Pat and Mike. They crossed the thigh deep water arm-in-arm. Photographs were required. It was right out of an Austrian fly fishing book! The canyon is lush with gooseberries, red raspberries, and huckleberries. This keeps the bears well fedundefinedand also the hikers. The raspberries were really sweet. Several of us stopped to fish at the second waterfall. A little further down, we passed Dennis and Rodney wet wading a granite cascade section, looking giddy with delight, catching fish, after fish, after fish... all goldens. At noon we reconnoitered at the intersection with Purple Creek Trail, set up camp, and dispersed for some of the best fishing and swimming of the trip. Those who worked at it reported thirty-plus fish on a range of files. It did vary some by location. Ants, Red Spots, Trudes, Mayflies, and even a Mormon Cricket pattern seemed to work. One pool alone had fifteen fish caught and released. Sizes ranged from six to eleven inches. The longer ones seemed a bit skinny though; not much for them to eat at that altitude. These were ninety percent Golden Trout, and they pretty much took anything presented. We saw only one other party in this section of Fish Creek. They were hikers, not fishers. With the second crossing and over a slight six hundred foot knoll, we arrived at the hot springs. There are many warm rivulets of water coming out of the side of the ridge. We soaked in a pool on one ridge. The water temperature was in the high 90's. The tub had rock seats and all. Pat made her own pool in one of the rivulets, damming it up with rocks. Were the packs lighter? Were we in better shape? This seemed easy. We found Tony sprawled out under a tree. Tony hikes at a pretty steady four miles an hour, up hill and down, so he was usually by himself, out front. No, Tony, that is not the campsite. We reconnoitered a bit [military term for wander] and camped near the bridge. Pat found some arrowhead chips and there are Indian grinding holes worked into in a large granite rock by the fire place. This site has a long history of human occupation! Rodney went back upstream to the cascades we had passed, and got the big-fish honors. 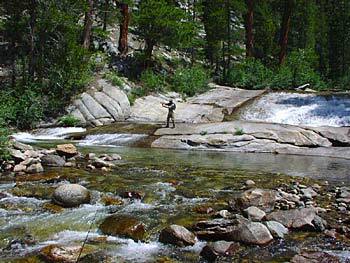 Others fished the meadow and down into the cascades. It was another "dozens of fish" day. Pat wowed us with a demonstration of steamed fish with spices and three-course meals. Heavy rain hit just before dinner. We were ready 'though. Each camp had put up a tarp, and we huddled under them like in Civil War pictures, sitting on bear canisters, making dinner, and telling fish stories. In the morning the river looked like chocolate milk. The hike out started with a climb of about seven hundred feet, then it followed the rim of a precipitous granite canyon with dramatic views and clear, cold streams in spite of the rain. A lot of this day's hike was through a large burn area from a fire in the early '90s. It was interesting to see how much growth had occurred despite the slow growth-rate at that altitude. Lighter packs, a week's adjustment to the altitude, along with stronger lungs and legs made the eight miles quite do-able. We had to do an extra stream fording due to the rain, and there were some swampy spots that had been very dry forty-eight hours before. In fact, the rain had made things easier where we had to walk through sand. Firmed it up. We left at 8:30, and by 2:30 we were at Reds Meadow. A great trip. 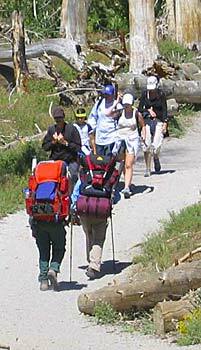 The last mile of the trail has a lot of casual hikers going to Rainbow Falls. Some of the children thought we looked like old-time miners, all grimy with big packs on our backs. Rodney thought they were "softies". A bus from Reds Meadow got us to Mammoth Mountain. While awaiting the retrieval of the cars, we watched the kids learning rock-climbing on the walls at the ski area, surrounded by a huge parking lot filled with hundreds of cars. Civilization. Gourmet dinner at Nevados topped off the experience. 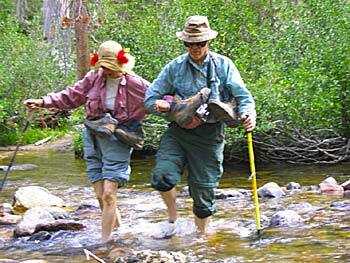 Have to return to day-hike the Duck Pass Trail with my family. Thanks to Pat and Mike for a wonderful trip.